The interface is divided into View Results, Download Results, and Survey Summary. This will show you the results, on a question-by-question basis, for all users who have verified the e-mail address they have attached to the results. After completing the survey they were e-mailed a verification link. If the e-mail address they gave was valid and they followed this link, their results will appear in this section. For more information on this, see the User Restrictions portion of the tutorial titled Add a Survey. 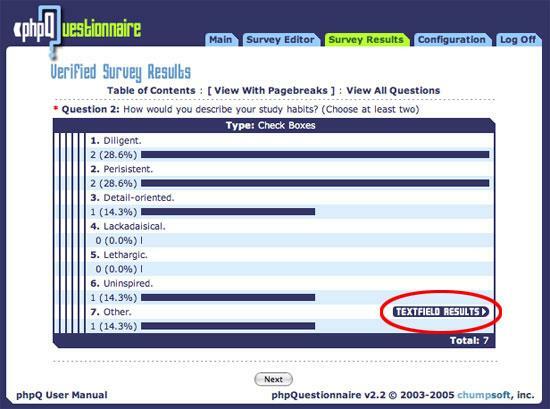 This section displays the results, on a question-by-question basis, for all users who have not yet verified their results. This means that either the e-mail address they provided did not work or they chose not to follow the verification link that was sent to them upon survey completion. These responses could still be valuable, and therefore, they are made available through this button. This button will display, on question-by-question basis, the results for all surveys, both verified and unverified. You may view statistics for each individual question by clicking on Table of Contents. This will list each question in the survey and allow you to view the results and statistics for each one by clicking on the question. 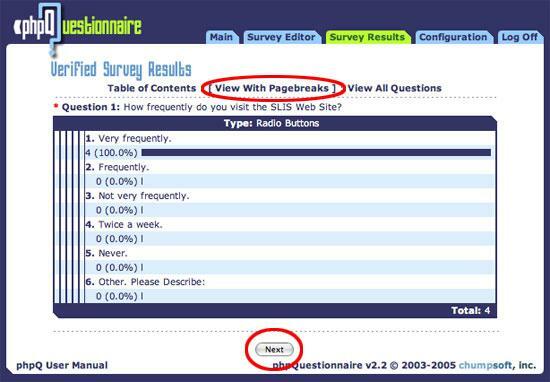 Selecting this view will display the results for each question on a page by page basis with a similar structure to the way the users completed the survey. After viewing one page of question results and statistics you can then proceed to the following pages by using the Next button. You can view the statistics for all questions in your survey at once by clicking on View All Questions. This will display the statistics for every question in your survey on one page. 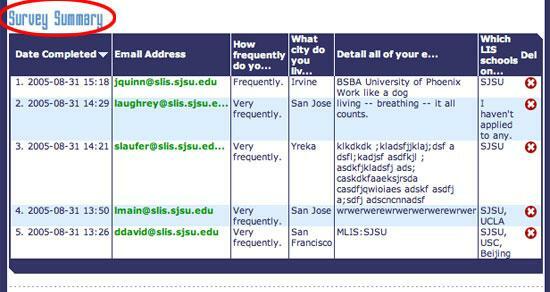 This is ideal for short surveys, but could be a lot of information on one page if your survey is very long. You can download the results of a survey. Once you have selected your survey, scroll down to the Download Results portion of the interface. Then, save the file locally to your computer. Note: CSV is the suggested format because it allows you to view the results in Microsoft Excel. A Survey Summary, located on the lower portion of the page, includes a list of the survey responses, the date it was completed, and user identification information. If Email Verification was used as a user restriction, the user identification information will be the address they supplied. Otherwise, an IP address for that respondent will be shown. It will also display the answers to any questions you marked to show in Display In Summary. For more information on this, see the Question Types portion of the tutorial. Select a question type and look at the Display In Summary attribute for that question type. The number of responses shown in this summary can be configured, and if the total responses overflows, there will be links at the bottom of the summary to view the next page of data. Note: This process cannot be un-done.